People barely had time to digest news Tuesday that Patrick Doyle would leave Domino’s Pizza by June before they immediately began speculating whether he’d go to Chipotle. Doyle quickly put those ideas to rest on Wednesday. Speaking at the pizza chain’s investor day presentation, Doyle said that he plans to focus on Domino’s until June 30, which will be his last day, and then he will spend six months “putting my feet up” and spending more time with his daughters. And then he’ll decide what to do. The comment is seemingly a direct shot at the speculation that he would succeed Steve Ells as Chipotle’s CEO. That speculation reared its head again when Doyle somewhat surprisingly announced his planned departure on Tuesday, an announcement that sent Domino’s stock down more than 4%. Chipotle’s stock rose nearly 2% at one point on Wednesday. The announcement didn’t include the word “retire,” and many observers wondered aloud whether Doyle would make a move to the Denver-based burrito chain. And Doyle said he has no plans to retire. Doyle’s departure, however, ends one of the most successful tenures in recent restaurant industry history. 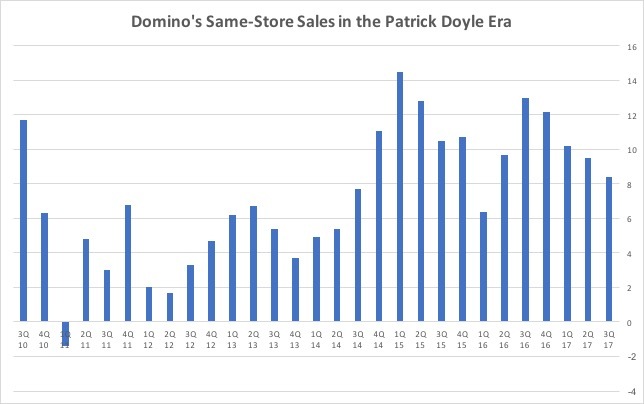 Domino’s has had only one quarter of negative same-store sales during his tenure, with an average of more than 7%, including an average of more than 10% over the past three years. 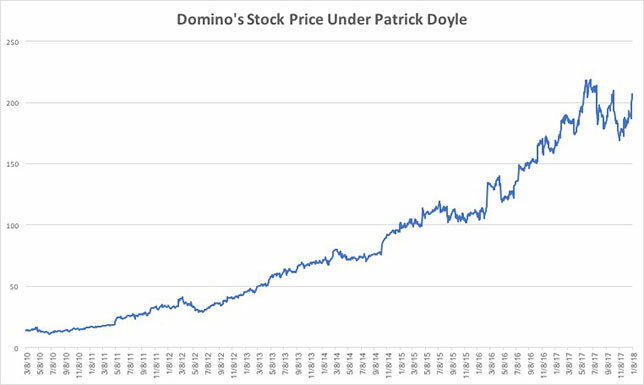 The performance, driven by improvements in the chain’s food in 2010 and one of the most effective uses of technology in the restaurant business, has sent the company’s shares soaring past $200 a share—they’d been trading in the midteens when Doyle took the helm in March 2010. An investor who bought $1,000 stock back then would have well over $13,000 today. Franchisees, meanwhile, are making more money, too. In 2008, the chain’s operators generated average annual earnings before interest, taxes, depreciation and amortization of $49,000. Today, operators generate an average of $133,000. In his statement at the outset of the investor day, Doyle said he simply decided he’d accomplished what he set out to do eight years ago. One of those goals was to have a succession plan in place. Richard Allison, president of Domino’s International, will take over as CEO in the summer. Russell Weiner, president of Domino’s USA, will become the chief operating officer, a new role for the company. Doyle said that public company CEOs should not stay that long.